I just finished reading Chris Anderson’s “Free” which, if you are interested at all in business models and the Internet you should read immediately. Golfblogger recently posted about a course in Michigan who is trying to use “Free” as a business model. Rather than repost much here, I encourage you to check out the post and consider the implications! Last spring, Lake Forest Golf Club in Ann Arbor offered a two year, weekday pass for $200. Since the regular price for walking a round is $25, after the fourth round each year, youre effectively playing free golf. Free golf clubs, balls, cart rentals or vacations anyone? This would be a better episode if it were about cooking steak, but as it were, it’s about what happens when your ball goes past red stakes. I guess I’m just hungry. I spent the week in Hilton Head and had a chance to play 2 nice golf courses – Barony and Oyster Reef. For the record, I really loved Oyster Reef, it was challenging and gorgeous – a terrific combination for sure. I had a new box of Slazenger Raw balls with me and got out 2 boxes for that first round at Barony. On the 4th hole, a 364 yard (blue tees) par 4 I jacked my tee shot dead left into the rough. I hit a provisional ball a country mile but wanted to see if I could find my first ball and play it out of the woods. After a few minutes of looking, I spotted 2 balls buried under some leaves, neither of which was my own. I traded the lost Slazenger for a Titelist and a TiTech and played my 2nd tee shot. Cut to 2 days later, about halfway through my round at Oyster Reef. I hit an errant tee shot on #6, a gorgeous par 3 overlooking a lake butting up against the harbor. 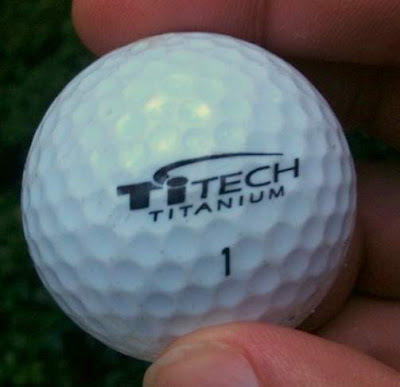 I managed to find my ball and as I looked down, I realized that it was that same Ti Tech that I had found at Barony. Some 18 holes later, I was still playing with the same ball! I resolved to finish the Oyster Reef round with this scuffed mess of a ball. On the 8th (we played the back first, so this was the next to last hole of the day), I hit my 3 hybrid about 200 yards to the right, and headed towards trees. I yelled “no” and desperately wanted my new favorite ball of all time to bounce back from the forest. To my shock, the ball came bounding off a tree and landed on the green! I knew I had a special ball, one that was going to do whatever it had to in order to stick with me, unlike those ungrateful Slazengers. Jerks. In any case, I 3-putted my friend for a bogey 5 (no one said the ball you have become attached to will actually go in the hole in less shots!) and headed to my last hole of the day. After somnething like 32 holes, I teed up a ball that I had strangely become quite emotionally attached to. My tee shot was again errant, this time slicing sharply to the left behind a tree jutting out into the fairway. I saw it bounce and I was elated. I was going to find it! I drove up and found my ball laying in a deep bed of leaves and had only one shot – a safe play back to the fairway. Unfortunately, I thinned it and flew it over the fairway into a bunker. I tried to play a 7 iron out and thinned it again – my best friend ever landed back in the bunker, unwilling at this point to even leave my side. A quick chip shot landed me in the fairway where I hit a beautiful 3 wood about 220 yards to the front of the green. I chipped it close and 2-putted for a triple bogey 8… but had managed to finish the round with this beautiful, mess of a ball that I might take home and put away forever. Either that or I’ll tee it up and see how much magic is left! We’re back with more of Paulina and Kate, this time checking their initial swing and knowledge of golf. Get ready for some laughs and some fun! Golf is Hard TV wants more people to play golf. We’re taking things into our own hands by creating some new golfers… Join actresses Paulina and Kate in this pilot episode. Where you put the golf ball turns out is quite important… who knew! Golf is Hard Episode 58 takes a closer look at why an inch here or there makes a difference. If you saw episode 57, you know all about casting… now watch as Marc gets an on camera lesson in Golf is Hard TV, episode 57! I’ve been waiting for months to finally get my chance to interview the mysterious Sheila, aka “Pink Diva” after reading her blog and trading messages with her on Twitter. I’m thrilled to unleash the Pink Diva Golf on Golf is Hard TV. We love Pink Diva Golf not only because we love female golfers, but because we are both proud dads who have our own golf girls. Q: Pink Diva’s Motto: Girls Golf, Get Over It! – talk to me… who needs to get over what, and why? Lets face it – golf is still a male-dominated sport. The motto is simply a light-hearted way to say girls are passionate about golfing too! Q: What is Pink Diva Golf and what is the inspiration behind it? Pink Diva Golf is an online golf boutique that offers women’s golf t-shirts, jewelry, and accessories with a hip, trendy golf theme. I was inspired to start Pink Diva because I couldnt find fun, girly golf shirts to wear on or off the golf course. And when I say girly, thats code for pink golf wear! Our golf boutique is unique because we carry one-of-kind items, exclusive to Pink Diva Golf and not the usual big-name golf brands. Q: Does the Diva got game? How often do you play? The Diva is working on her golf game  no handicap yet. But I found a fantastic local LPGA golf instructor who has really helped me improve in the past year and I recently joined my local Executive Womens Golf Association (EWGA) chapter. My biggest challenge is finding people to golf with, so joining my local EWGA will be a great way to start playing more often. Right now I usually play two or three times a month. Q: What’s one message you would love to give the next guy who plays a golf round with you? Q: Do guys like playing golf with women? Why/why not? Thats a trick question, right? I think it depends on the player! There are many men who love to play golf with women and others who are more comfortable playing only with the boys. Regardless of the sport, I think players should learn and follow the rules of the game and do their best. In golf, players should make sure theyre keeping up with the pace of play and following etiquette. Ive seen both men and women not follow the rules at times, but it seems women golfers get a bad rap for this  and thats not always true! Q: Can you tell us about the new Pink Diva website and the Golf Bling line of apparel? Yes. We have redesigned the Pink Diva Golf website with a new look and feel, including an easier to use online store! The website still offers a golf boutique shopping experience with one-of-kind t-shirts, jewelry and accessories, but also a new line of Golf Bling shirts! What is Golf Bling you ask? Take a high quality ladies t-shirt, add Swarovski crystals, and arrange them into a stylish golf design and you got Golf Bling! The jeweled shirts are available in five styles, including Kiss My Putt, Par-Tee, I Heart Golf, Golfer Girl and our classic Pink Diva logo. For more info, visit Pink Diva’s newly redesigned site and her terrific Pink Diva Golf blog. This new Golf is Hard TV episode features Coach Dave talking about casting the club head for better distance and control. Forget what you’ve learned!